This is an all-valve, high voltage power supply for valve equipment. The rectifier is a valve type GZ33. 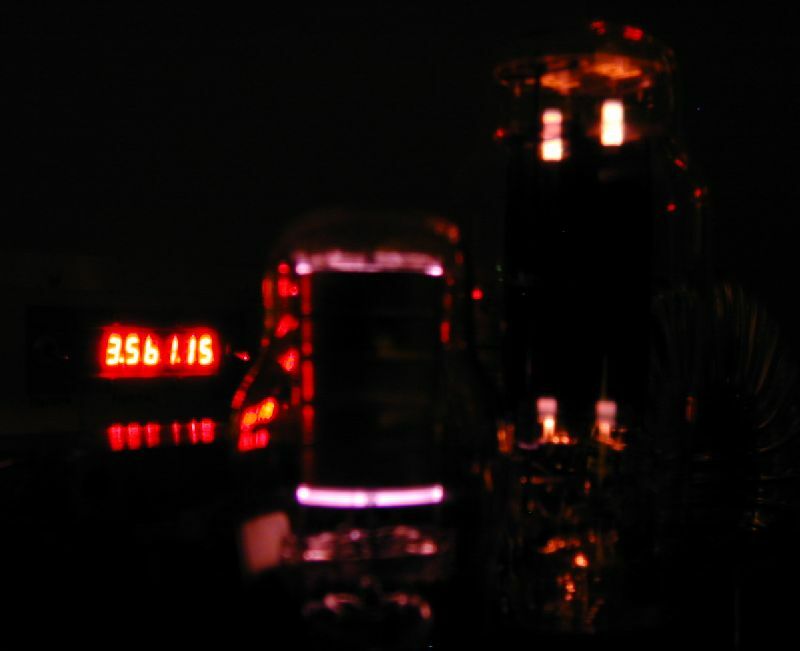 Many thanks to Bill G4KKI for generously giving me this rectifier valve for this project. The PSU also includes a VR150/30 150V voltage regulator to supply stabilised power to the VFO. In the picture below right, G0UPL admires his new PSU in operation while monitoring 3.560MHz, the international 80m QRP CW calling frequency in the background (see station details). This power supply measures 10 inches by 5 inches (25 x 13 cm), stands approx 6 inches (15 cm) high, and is very heavy due to the transformer and choke. The tranformer must have two 250V secondaries and a 5V @ 3A secondary winding for the heater of the GZ33 rectifier. 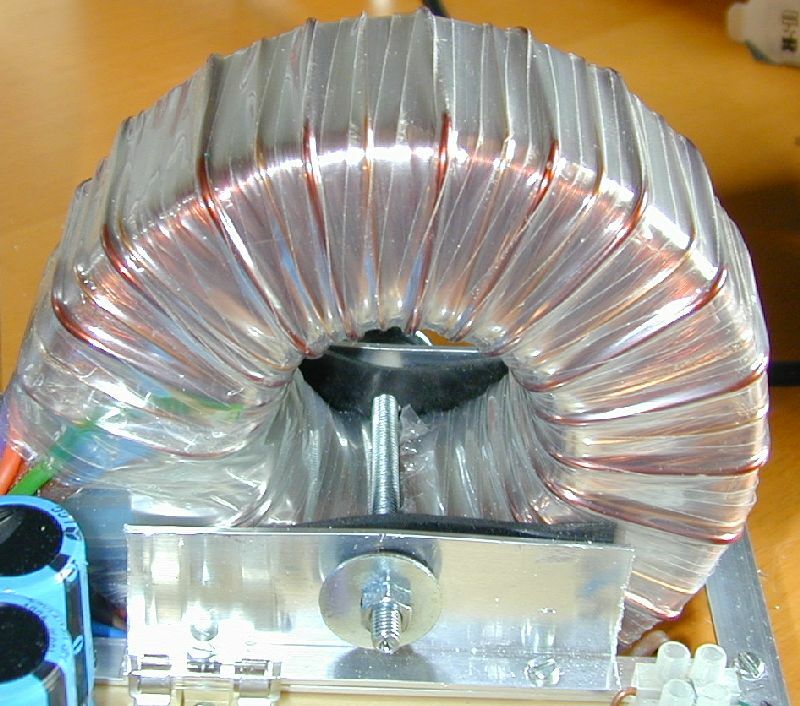 A custom hand wound toroidal transformer part number 7603 from Airlink Transformers is used. 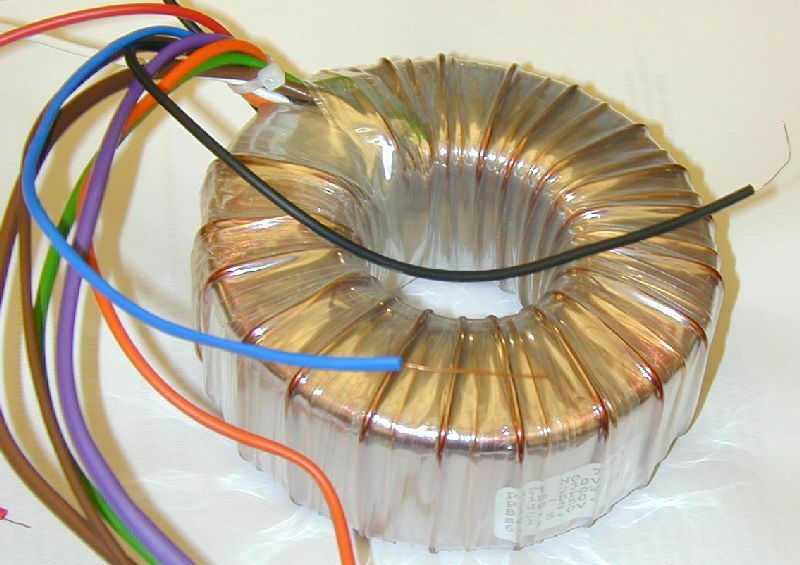 Toroidal transformers have many advantages compared to conventional EI-style transformers, including higher power density, higher efficiency, less acoustic vibration, and very low magnetic radiation (thereby reducing potential hum). Ok, I admit it. They look more cool too. 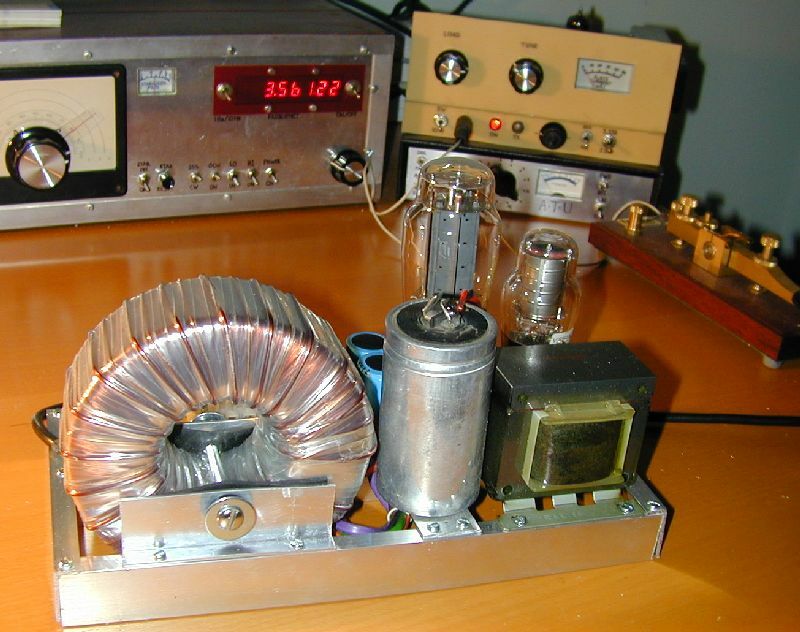 The rectifier is a full wave type using two diodes (in the GZ33 valve envelope). The two 250V a.c. secondaries are connected in series, the centre point forming the ground connection. Due to the low secondary winding resistance of toroids, surge current at switch on can be high and reduce the life of the rectifier. Because of this, resistors are used in series with each anode. The smoothing circuit after the rectifier consists of a pi-network of a 16uF bipolar capacitor (non-electrolytic), 5H choke, and 400uF capacitor. 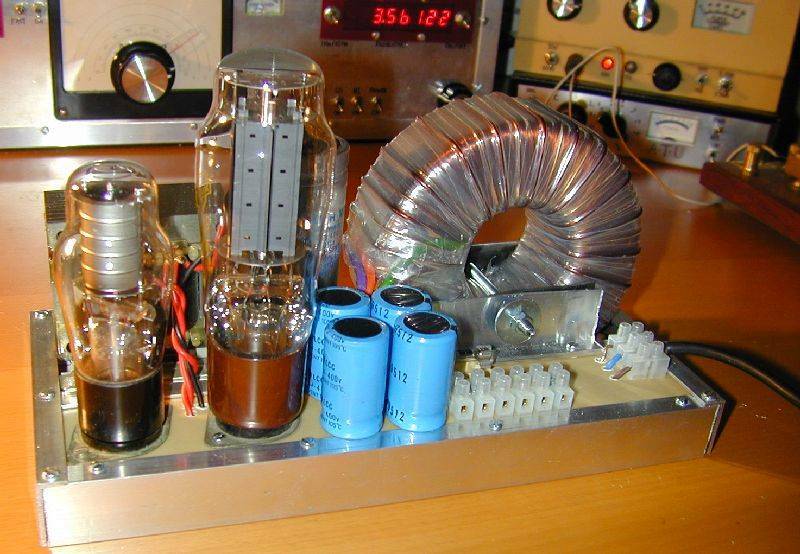 These components were supplied by Jan Wuesten, who advised the use of a non-electrolytic capacitor at the input of the smoothing network for robustness. The 44K resistor across the output is very important from a safety point of view. With it in place, the high voltage across the capacitors discharges safely within about 10 seconds of switching off the supply, and it therefore becomes safe to work on the circuit. The voltage regulator uses a type VR150/30 cold-cathode gas stabiliser valve, which belonged to my Father. Thoughtfully the designers of the VR150/30 connected pins 3 and 7 internally, enabling the HT supply to the regulator to be passed through the valve before meeting the series resistor. This would prevent the whole HT voltage appearing at the regulator output in the event the regulator valve was removed, thus protecting downstream circuits. The series resistor of 5.5K is chosen to ensure the maximum current in the regulator valve under no load conditions does not exceed the rated maximum. In operation the valve glows a very satisfactory purple colour. Note: Adequately rated components must be used, i.e. sufficient voltage rating for capacitors and wattage ratings for resistors. 1. The 44K bleeder resistor is made up of 2x 22K 2W resistors in series. 2. The 55 ohm anode series resistors are made up of 4x 220 ohm resistors in parallel. 3. The 5K5 voltage regulator resistor is made up of 4x 22K resistors in parallel. 4. The 400uF smoothing capacitor is made up of 4x 100uF capacitors in parallel. Construction uses a chassis frame built from L-shaped aluminium corner pieces. The toroidal transformer, 16uF capacitor and 5H choke are bolted directly to the chassis. The other half of the chassis uses a base made from single-sided PCB material bolted to the frame, and holds the 2 valves and all other components. The toroid is supplied with 2 rubber disks, one metal disk and a nut and bolt, intended for bolting the toroid against a planar surface. In my case for good looks and compactness I elected to mount the toroid perpendicular to the chassis as seen in the picture. Sections of one rubber disk were cut and one side of the transformer bolted into the chassis between lengths of aluminium lengths. Unfortunately, the bolt and the chassis produce a complete circuit, effectively a single loop through the toroid. The 5V winding of the toroidal transformer consists of 18 turns, so the voltage across this short circuit will be one eighteenth of this. However the current can be very high, and this causes a large heating effect. Fortunately, I know from bitter experience to be particularly observant when first applying power to a circuit under development. I listen carefully for crackles and pops, look for smoke, and sniff for nasty smells. A few seconds after applying power I could detect the smell of burning rubber, and switched off before too much damage was done. Only one or two layers of the plastic tape wrapping the toroid had melted where in contact with the mounting bolt. I realised the cause of the heat almost immediately. To avoid this problem I procurred a slightly longer bolt, two rubber tap washers and a large metal washer. I enlarged the holes in the aluminium chassis and inserted small sections of tubing made from the outer insulation of a section of coaxial cable, and held in place by pressure applied by the rubber mounting sheets. Effectively the bolt becomes insulated, in fact insulated at both ends as a double protection. So toroid mounters, beware! Anything passing through the centre of the toroid can effectively become a secondary winding.